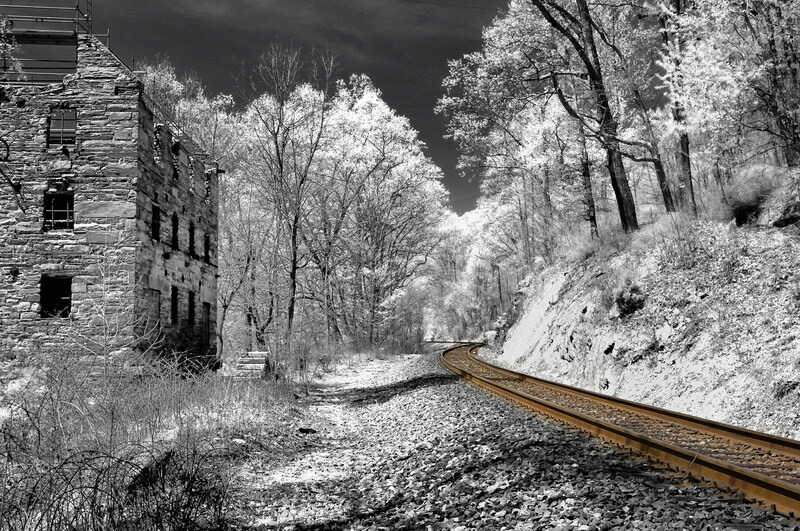 The subject of infrared photography is a logical follow on to the previous section, monochrome. 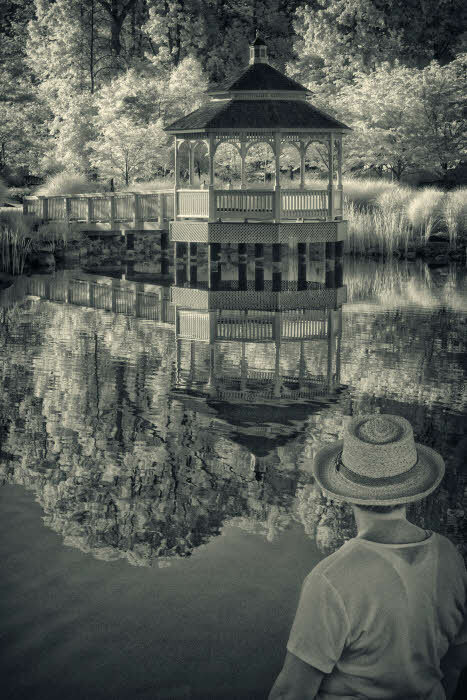 Infrared (IR) images, as captured in camera, are by nature monochromatic (without the necessity of the color to B&W conversion post-processing step needed with color images). IR photography is, for me, great fun. 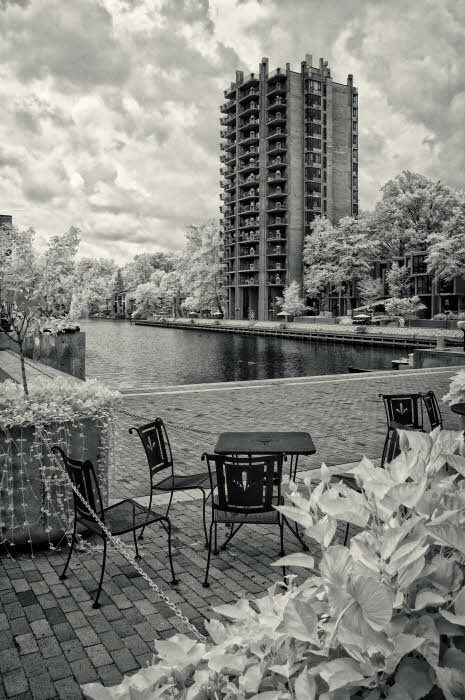 Further, since I’m primarily an outdoor photographer who doesn’t care for the stark contrasts of mid-day light, IR is a good mid-day photography alternative. IR images often have a magical ethereal look that I find appealing (but IR is often an acquired taste; a competition judge once announced that she would automatically throw out all IR images based solely on her personal bias). A special IR filter must be used. Here is one example, there are several manufacturers. Exposure is trickier for me in IR. I normally bracket at least three exposures and check the exposure carefully between shots even if the lighting appears to be unchanged. 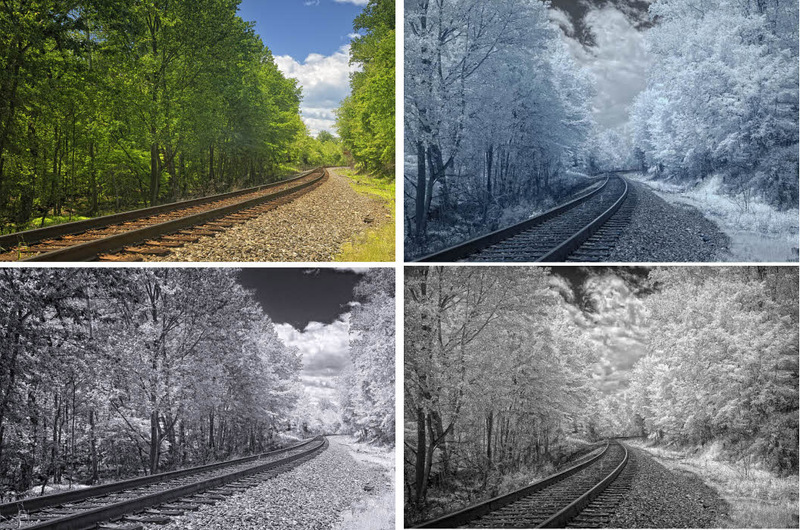 However, green foliage & blue sky will appear as white & black respectively (or nearly so for both) in IR. For an update to this post (11/17/10) look here. Examples – Before going further, let’s look at some images to see how the appearance of an IR image differs from that of a conventional B&W. The top row is as it came from the camera; the bottom is after color to B&W post-processing conversion. These images were made with my Nikon D70 before it was permanently converted to IR only usage. The IR was done using a Harrison & Harrison screw in IR filter. A color cast (red in this case) is common when making IR in this way. The image resulting from color to B&W conversion is directly below the color image – ditto IR. As with all things – experiment and know what happens BEFORE you try this on a shot you really want to get right. Foliage is white (light) in infrared. Compare with the B&W. Many viewers mistake IR for snow scenes. When starting out with digital IR, the filter approach is a good way to begin. All other things equal, the quality is about the same with either. Do not believe the ads for a IR software post-process that purports to give the same results starting with a color image as you would get in-camera with an IR filter or an IR converted camera. 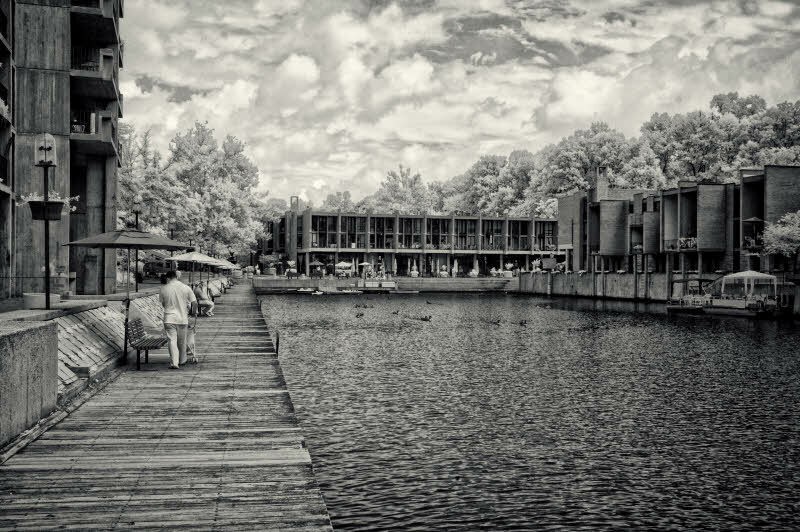 Look at some classic film IR images and you’ll notice that the highlights seem to glow. 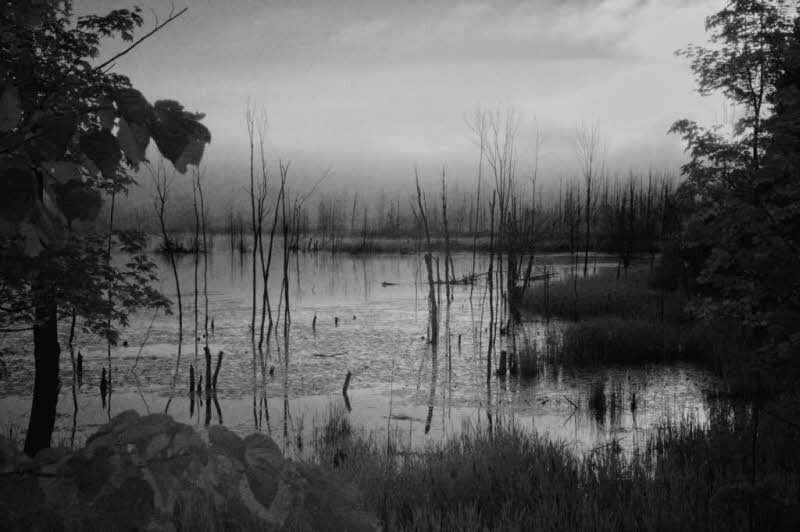 A heightened grain effect is another characteristic of some film IR images. Both of these effects can be simulated in digital IR during the post-processing. 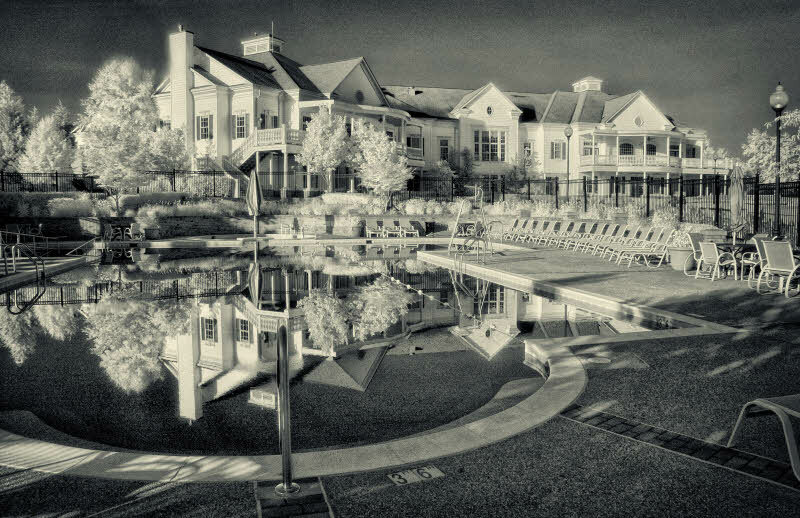 Here is a comparison of my SEP faux-IR preset style and a “real” IR made with my IR converted Nikon D70. Click to enlarge. The top row is from the camera; note that this IR has a blue cast as compared to the IR filter’s red (but, as I said, it’s not important). The left column is color from a Nikon D300 and the result from the Nik SEP free download filter that I designed. and see how many of these appear (or not) in the images that you judge to be most successful. Enjoy. A favorite. The message is that it’s rarely about the equipment. One of my first IR images; made with a 5MP Point & Shoot with a screw in IR filter. Note the blur in the leaves framing the top of the image due to the 2 second shutter speed (which I think I prefer over something sharp and well defined which might be a distraction). The image exhibits the ethereal feel common to many IR images. Meadowlark Botanical Gardens. This image and the two that follow are free of the “hand of man”. 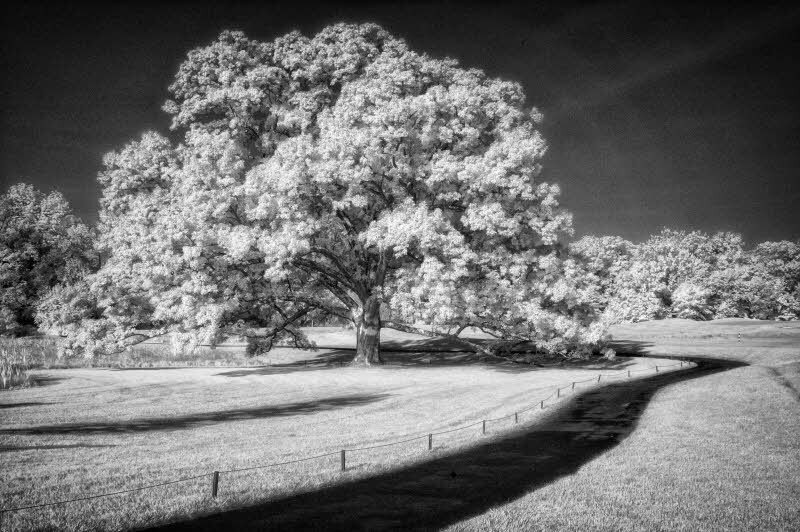 A faux-IR software approach might yield similar results for these all natural settings. This image relies heavily on textures, contrasts and tones. The sharp change in contrast due to the low sun coming from the left provides “modeling” of the far mountain. The scene would suffer without it. Shadows can be both an asset and a liability in IR. Sunrise at Shenandoah National Park. 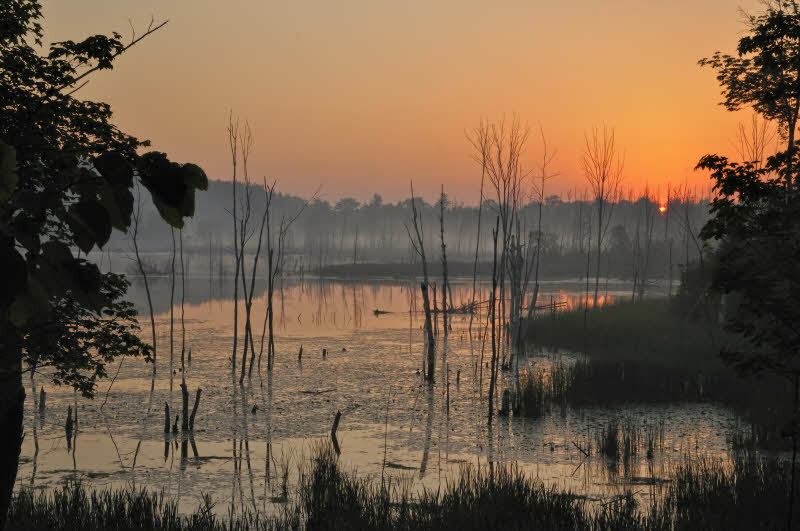 A more intimate nature image than the previous panoramic landscape. 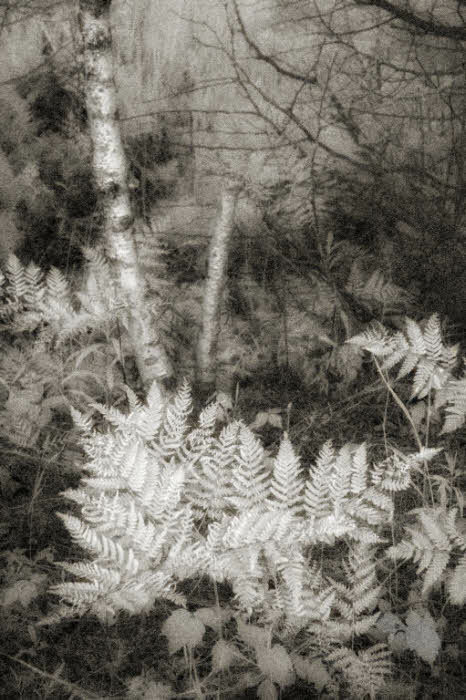 It uses all of the “success factors” which are enhanced in comparison to a normal B&W image due to the IR white foliage effect – especially the near fern which was in brighter light than the rest. Sleeping Bear Dunes. IR depends on reflected light as does all photography. The difference between IR and color is the frequency spectrum of the light. IR uses the infrared spectrum (duh) whereas “normal” photography goes to lengths in order to avoid having IR reach the sensor (like using filters over the sensor to block IR; removing such filters is a main element of converting a camera to dedicated IR use). So what? Well, IR “light” from foliage is a characteristic feature of an IR image. What happens if there’s no sun (as here, cloudy morning just at sunrise)? The first thing that happens is that foliage is not as white as usual (see lower left corner). The second, and more important, thing is that you can still capture wonderful monochromatic images. I was looking for mood in this image (actually I was looking for a colorful mist filled sunrise but it took five consecutive mornings at this spot – 5 AM wake up – before getting it). Sleeping Bear Dunes. Next, let’s introduce the hand of man. In this image, & the next several, we’ll use the hand of man to place one of the five “success factors” in a prominent role – the line. Here we have this large oak – a shape – in contrast against the dark sky. I hadn’t mentioned this before, but another unique feature of IR is the tendency for blue skies to be rendered black. Foliage reflects (white) and the sky absorbs (black) infrared. 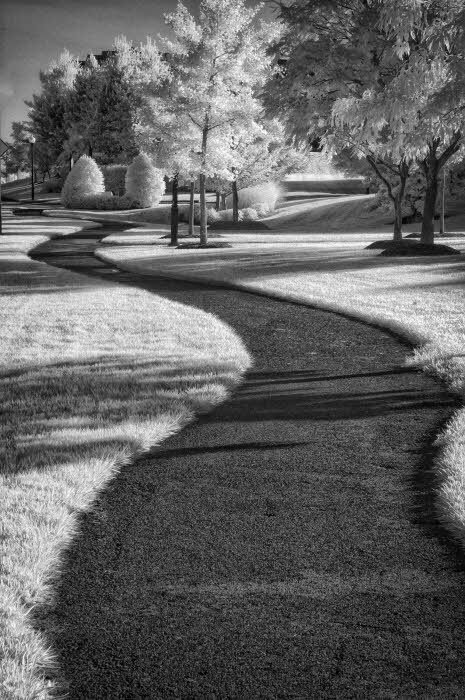 Without the path, this is a nice enough image but it improves greatly with the addition of the starkly contrasting leading line to take us to the shape in the mid-ground (an early composition lesson – more to follow when we move from Craftsmanship to Composition later). The textures of the grass and leaves and wide range of tones also contribute positively. This image would work in color but not very well in conventional B&W. The image is about the fence – a line. 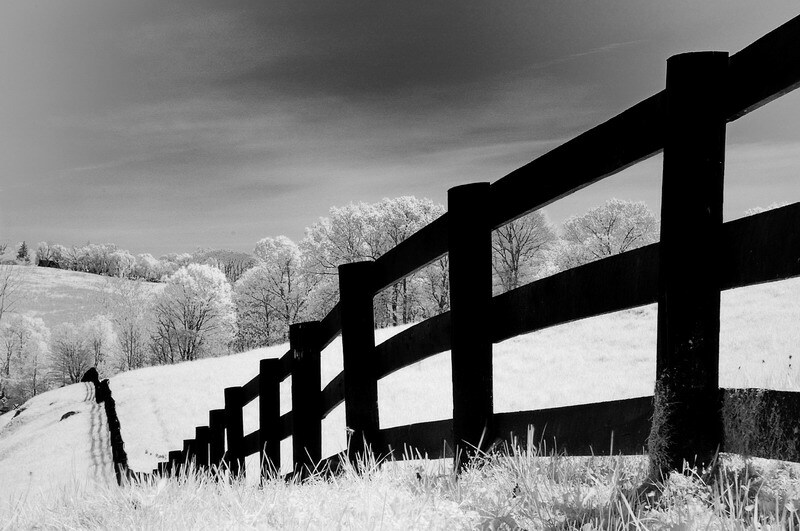 In B&W the stark contrast between the fence and background, seen in this IR version, would be reduced as the green’s gray tone would be too dark. Film shooters could lessen the problem in B&W by the use of a colored filter (digital as well by applying the same color filter either during capture or in post processing). Again, a story about a line – a line with mystery about where the path is taking us through a land with ethereal glowing foliage. As in the previous example, this scene would not work nearly as well in conventional B&W due to the loss of contrast. A final “line” story – enhanced through the use of selective color. One thing I’ve lost by converting to a dedicated IR camera is the ability to do selective color conveniently. I mentioned earlier that with a screw in filter, which is opaque, the shot must be composed by looking through the viewfinder before attaching the filter (pure black view with it on). Since this step is necessary, why not take a color shot before attaching the filter? I always did. 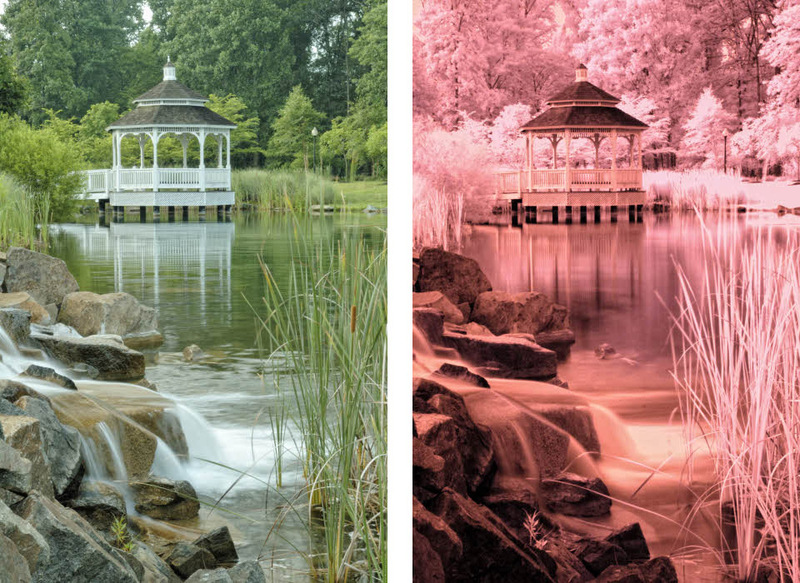 Once you have both a color and an IR version, adding selective color in post-processing is easy. 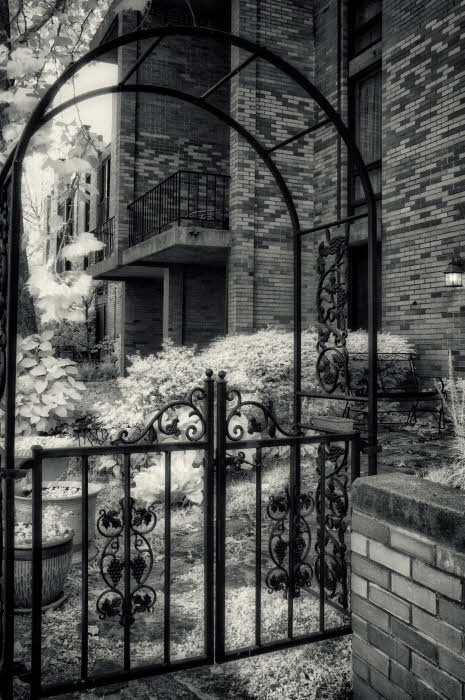 Note the how IR’s dark sky and white foliage work together to enhance the contrast of natural elements. Beverly Mill near Thoroughfare Gap. A post-processing observation. Many “purists” (I’m almost one) would ridicule this selective color “enhancement”. “It’s not what you saw through the viewfinder.” While there are post-processing things I don’t condone – starting with adding or deleting objects – the previous objection (heard with my own ears) is silly. What part don’t you think I saw? Oh – The rusted railroad tracks. Well, trust me, they were there and that was their color. Oh! – you meant adding their color to this IR image is what’s wrong? Well maybe I’ll agree but moving on – what part of black and white do you think was visible through the viewfinder when I did this? You say none of it but that’s OK because of tradition. Hmm. Well, if you accept B&W even if I didn’t see it, what about those white trees? In true B&W they’d be gray. Oh – that’s OK since it’s IR. I’m puzzled. I guess I don’t understand the problem and/or the rules. 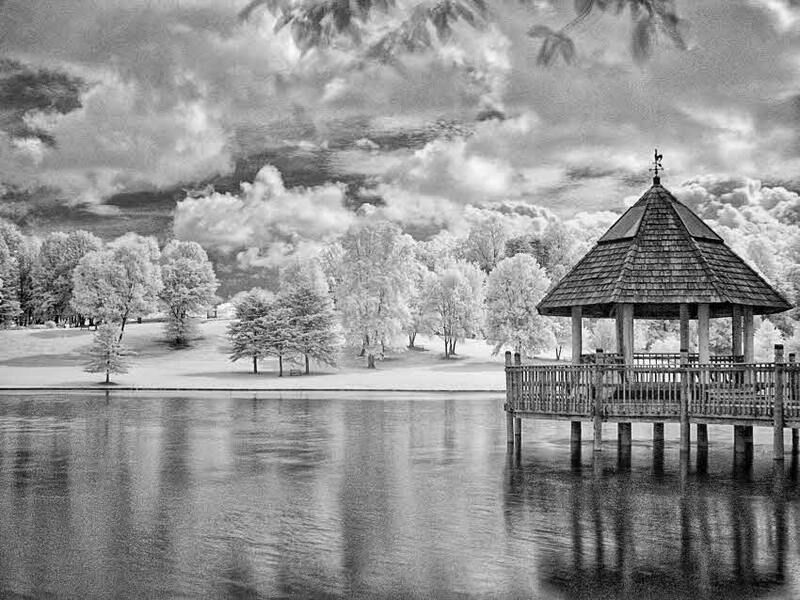 Regarding this IR image trumping color and B&W – for those HH members who have stuck with me to here, I’ve got an offer. I have two screw-in IR filters that I no longer use and are available for short term loan (or purchase). One is a 52mm used with my P&S which may not have much use as most lenses use a larger filter unless you’re willing to step it up and live with the vignetting; the other is 67mm. Try a screw in filter & you can make all three types of images – color, B&W, and IR – with just two exposures. It’s worthwhile to experiment with different scenes and see for yourself what works best, when. Another idea, arrange a group and wander through HH together sharing the filter and experiences. You can’t learn photography just by reading about it. Get out & do it! IR dark sky and white foliage to accent a man made structure is a good use of infrared imaging. And people work in IR, too. Some wedding photographers use IR, at least in part, for their work. And to wrap it all up (are you still awake?) how about an IR that’s entirely about the hand of man – and made in a driving rain, to boot. 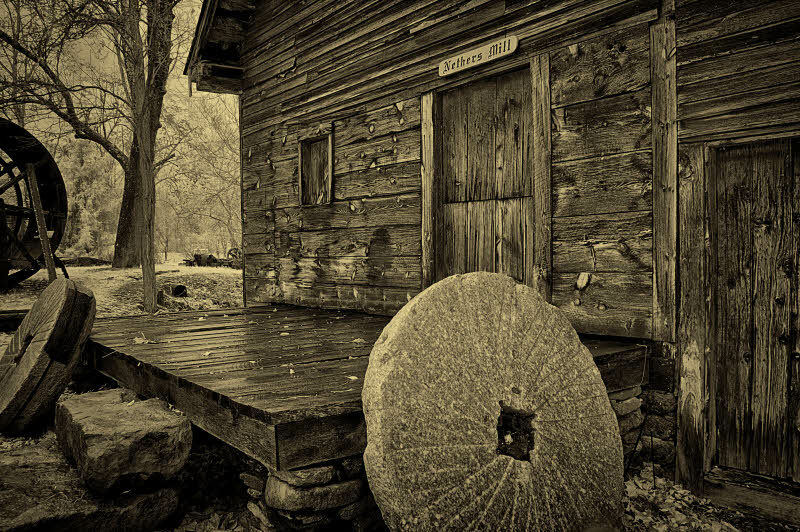 I added some sepia tinting to this image in post-processing because I felt that it fit the subject & the mood. What works for me is usually all about mood. Lots of shapes, textures, contrast & tone. Lines, too, but not as normally thought of from a composition point of view. 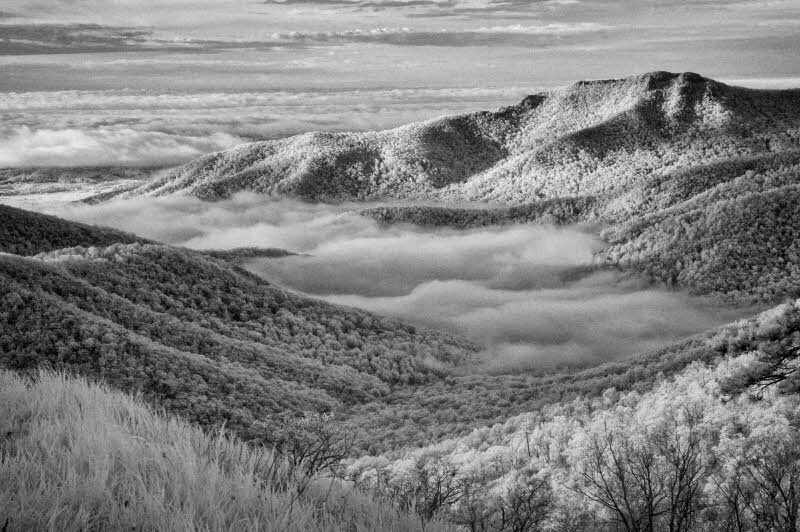 My thanks to Carla Steckley who 5-6 years ago presented a program on infrared photography and got me started down this magical, ethereal road of IR. This entry was posted in Color and tagged Black and White, Black and White Conversion, Black and White Photography, Digital, Digital Infrared, Infrared, Infrared Photography, Photography, Photography How To, Photography Technique, Photography Tips, Photography Tutorial by Ed Knepley. Bookmark the permalink. Oh, my heavens, Ed! I was going to skip this post, figuring it would not be of interest to me. But, I have spent the last few hours absolutely stunned and absorbed in it. It is incredible. Thanks, Lois. Glad that you enjoyed it. I got a bit carried away with the example images. really nice IR pictures. I wonder if you have pictures of a raining scene both with IR and true colors? I would be really interesting into having these type of pictures for a specific document I am writing. If any, we can get in touch. Well, to her credit she was honest & frank about it. That way the competitors at least know that it was no fault of theirs that their image was “out” – but I agree with you.